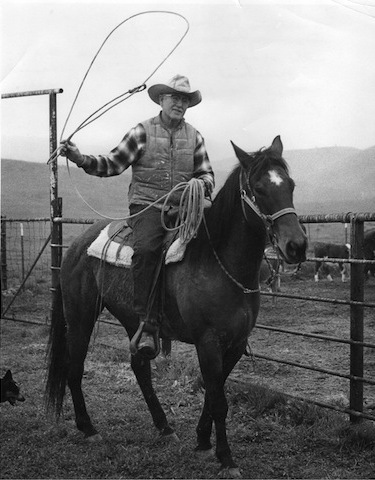 Samuel Snedden didn’t start out to raise cattle. He came from Pennsylvania to follow the gold strikes through the West-California, Oregon, and Mexico regions. While working a claim in the Kernville area of Kern County, he traveled to Gorman’s Station south of Tejon Pass for supplies. There he met his future bride, Anna O’Keefe, who was visiting the cattle ranch and general store of her sister and brother-in-law, Johanna and James Gorman. Samuel and Anna soon learned that they shared the same daring pioneer spirit. Young Anna O’Keefe, was having her own adventures. She and her sisters had made the event-filled trip “around the Horn” to southern California. Anna, convent-trained in fine embroidery and sewing, went to live in the beautiful block-long home of the renowned Don Abel Stearns in Los Angeles. There she learned Spanish, sewed for the family and taught Dona Stearns, a member of the wealthy Bandini family, to speak English. Married in 1867, Anna and Samuel made their first home near Samuel’s mine in Kern Valley. When Anna heard of a cattleman who wanted to sell his herd, she used $300 of her own savings to buy it, thus beginning the Snedden family cattle ranching history that actively continues today. The workload from the cattle ranching forces Samuel to drop his mining ventures and they bought the “Fay Place” in Kelso Canyon, east of the present Lake Isabella. In the drought of 1876-77, the Sneddens lost almost half their herd due to the lack of grass and the high number of cattle that were grazing on the common range. Samuel decided his cattle would be better off in the Mojave Desert where there would be no other cattle to compete with. He figured to follow the jack rabbits to locate water holes and his plan worked for a time. But in 1879, the continual need for more grazing land prompted the Sneddens’ decision to move over 100 miles away to the Lockwood Valley in Northern Ventura County, where Samuel had once mined lead. Samuel and his two sons, David and Bertram, aged nine and eleven, with the help of two Indian vaqueros, drove the cattle to their new home. After weeks on a trail that took them through the Mojave Desert, through the Antelope Valley and up over the Gorman Divide, they arrived in the Lockwood Valley with their herd of 130 grown cattle and 60 branded calves to be greeted by cool, clear creeks, grass among the sagebrush, and no other cattle in sight. The Sneddens were the first family to settle there and Anna founded the area’s first school for her five children and those of John and Margaret Cuddy. At that time, none of the land in California’s high mountain valleys had been surveyed, so settlers built their houses wherever they wished. The whole Snedden family helped with the big project of building their home out of twenty-four foot long yellow pine logs. Their first brand was just a “76”, which Samuel sold with the cattle that remained in the Kern Valley area. In 1880, Samuel designed his “bar horse-foot” brand and registered it with Ventura County and later, the State of California. This brand is still in use on the ranch. In 1887, the Snedden family bought their first piece of land in this rugged mountain country, eighty acres of rocky creek bed near Lockwood Creek, and finally in 1891, Samuel received his patent on his home site of 160 acres, signed by President Benjamin Harrison. Due to the bitter cold and snowstorms in the Lockwood’s mile-high mountain meadows, in 1898, the Sneddens leased rangeland from the Hudson family that was located in the Pleato Hills, south of Maricopa. This made for a nice warm contrast to their mountain country where in January 1907, a vicious snowstorm dumped over six feet of snow and they lost over 200 head of cattle. 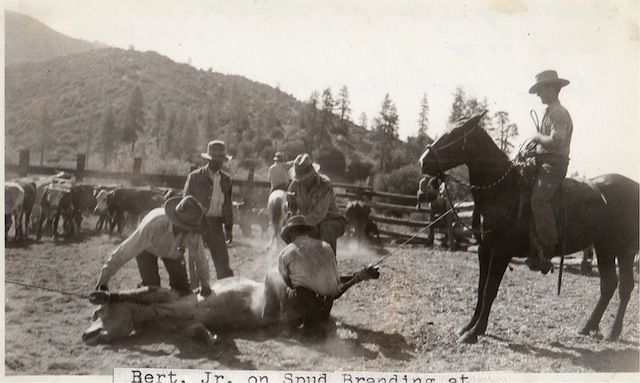 In 1916, the need for permanent winter range prompted Samuel’s son Bertram to purchase rangeland in the Santiago Creek area southwest of Maricopa where the Sneddens have continued to build up the ranch property they have today. Today, Richard and Susie Snedden, along with their son Austin and wife Sarah, and their four eager ranch hands; Ryah, Rainey, Sonora, and Ezra continue to operate their working cattle ranch in the Santiago Creek country in southwestern Kern County.